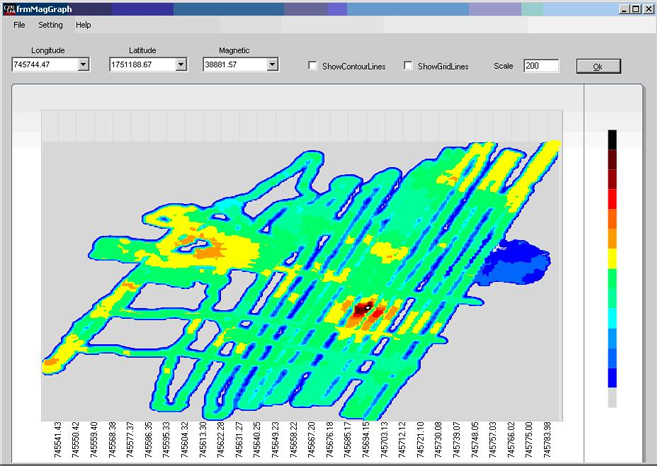 GEMLink, has been upgraded with a variety of new features to enable easier visualization of results and deliver basic forward modeling. 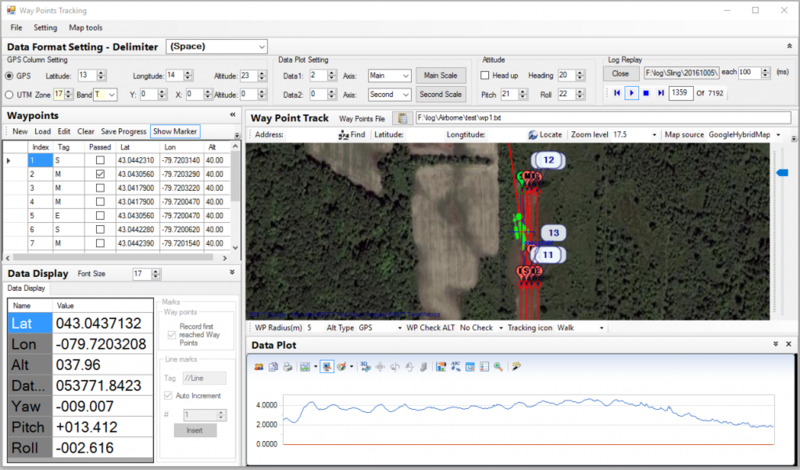 The new GEMLink features in V5.4 include functions “Waypoint Plan” and “Waypoint Tracking”. “Waypoint Plan” is used to automatically generate survey points by the quick polygon drawing function. Details of this function will be described in the GEMLink user manual. “Waypoint Tracking” will track your position and check that each waypoint is reached during the survey. It will also graph mag data in real time. This version of GEMLink is intended to be more stable and have higher capacity for serial port data transfer for all Windows OS with several improvement and bug fixs. The software is available for free download from the web site. You can keep original GemLink V5.2, v 4.0 and V3.0 in the same PC. Welcome to the v5.2 version of GEMLink for Windows. This version of GEMLink is intended to provide an reliable and robust system for rugged applications for all Windows OS. It allows Multiple GemLink running simultaneously without confliction. Also it gives an upgraded interface to the Windows operating system and streamline data transfer to and from the magnetometer. The software is available for free download from the web site. You can keep original GemLink V4.0 and V3.0 in the same PC. If you experience any difficulties or have suggestions, we would appreciate hearing your comments. Please send an email to info@gemsys.ca and include “GEMLink V5.2” in the header line of your email. The serial components of serial communication has been completely migrated from VB v6.0 to .net. It allows most of USB-RS232 driver working seamlessly. It will overcome most problems when running on Windows Vista/7. Stack (Mirror) data plotting for VLF diagnostic. The new Windows version of GEMLink migrated from VB v6.0 to VB.net. It gives robust data transfer with software flow control. Also it added some new features including real-time data plotting, magnetic field map plotting, mirror data plotting. The software is available for free download from the web site. 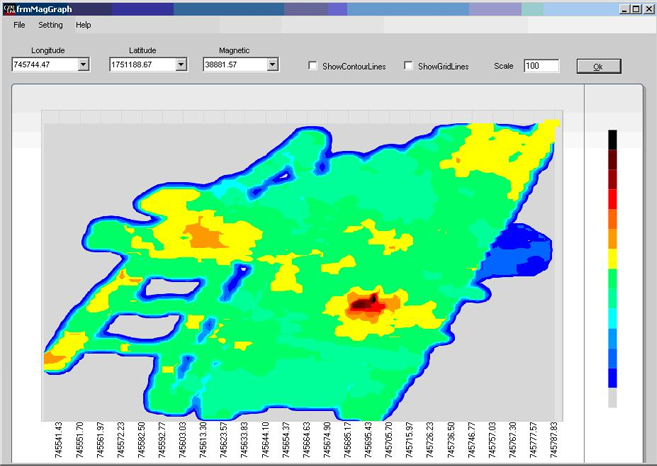 It offers a number of time-saving features including Personal Computer-based data reduction, Internet software upgrades, way point transfer and merging of magnetometer and DGPS data. 1. User-defined Multiple Channel Real-time Data Plotting. 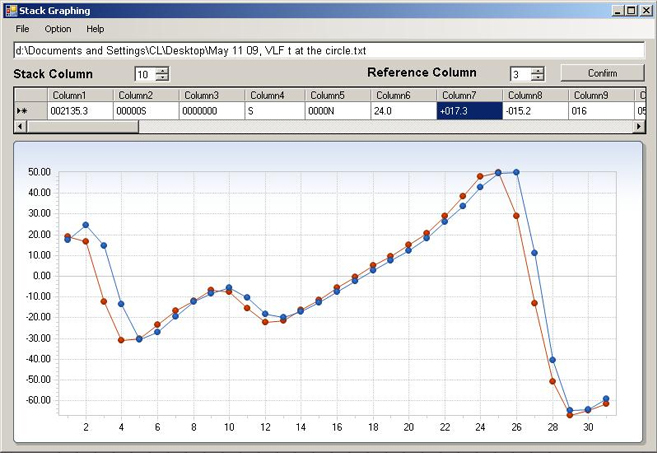 As shown below, users can capture real-time sampling on main window while plotting on other windows simultaneously. User can select the columns to monitor magnetic fields simultaneously up to four channels. By changing the Min/Max values manually, the plot can be zoomed in/out. It is very useful to set up, tune system. It can show up to 10 minutes historic data. Figure 1.1. Real-time Data Plotting. 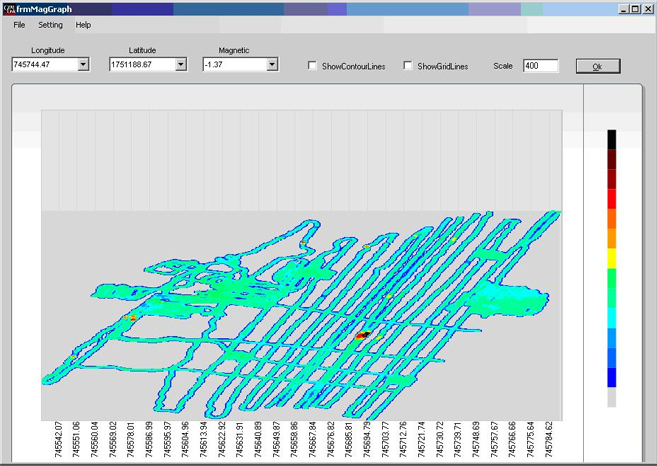 A basic magnetic map plotting feature is added as shown below. Figure 2.Magnetic Field with Grad Scale 100. 2. Magnetic Field with Grid Scale 200. Figure 2. Grad Field with Grid Scale 400. 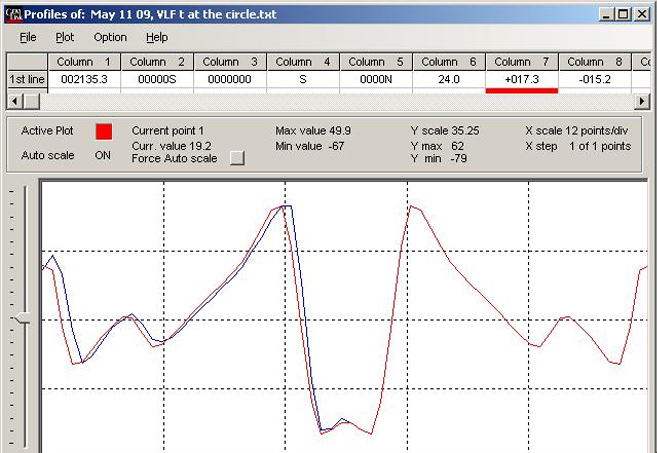 For some application such as VLF, it may need to plot stacked or mirror pictures to tune or adjust sensors & systems. In version 5.0, two applications are added as shown below. Figure 3.1. Plotting Stack Data. Figure 3.2. Folding right to Left. In version 5.0 User can either capture ASCII code or Hex code. Figure 4.1. Main Window Capture Hex or ASCII code. GEMLink has recently been upgraded to .net framework version 4.5 platform. The most important additions are a plotting utility that graphs profiles of magnetic data and a Geographic Coordinates conversion tool that converts between Geodetic (Latitude and Longitude) to UTM coordinate systems. 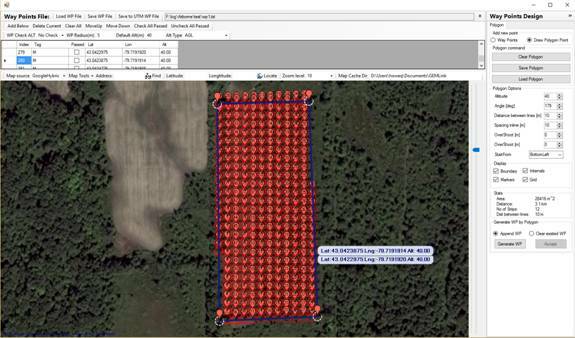 The latest version also supports satellite map integration from Google, Yahoo!, and Bing which allows line planning as well as real time survey tracking. GEMLink gives smooth and reliable data downloading with flow control option. GEMLink 5.4 (Updated May 2017) is available for Windows Vista, Windows 7, and Windows 10. When transfer of the GEMLink v5.4.zip (91.6Mb) file is complete, extract the corresponding *.zip file and run setup.exe on your computer. An older version of GEMLink is available for users with Windows XP and previous operating systems. Click the link below for support on these systems. GEMLink 5.3 is available for Windows Win98 Second Edition, Win ME, Win2000, and Windows XP.